St. Mary's is certainly a San Francisco secret. If you know about it, you are well-informed! This neighborhood jewel is presently under construction until approximately May 2009. It houses a pristine multi-purpose field with two baseball diamonds, a basketball court, two tennis courts, hop scotch and four square courts, and a small playground with a large sand pit! Restrooms are available here. Dogs are welcome too and they will enjoy frolicking in the dog run! 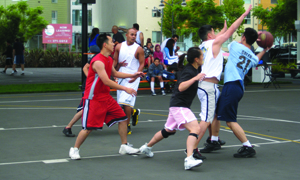 14-Mission -- Mission and Richland; walk south to Crescent Avenue and east to the park. 23-Monterey -- Crescent Avenue and Leese Street/Agnon Ave.
67-Bernal Heights -- Crescent Avenue and Leese Street/Agnon Ave. It was 60 acres of rolling hills, pastures and tidal marshland in 1862 when Archbishop Alemany laid the cornerstone of St. Mary's College. When the college moved to Oakland, Archbishop Riordan established St. John's Parish, in which St. Mary's Park lies, and rented the land as a truck farm for fruits and vegetables. In the early 1920s, the property was converted to a housing subdivision and in 1924, the Board of Supervisors adopted, and Mayor James Rolph approved, the planned residential development. Its six streets were laid out in the shape of a bell and named for people associated with the origins of St. Mary's College. Source: 'Welcome to St. Mary's Park,' St. Mary's Improvement Club; 'Centennial 1893-1993,' St. John's Parish. 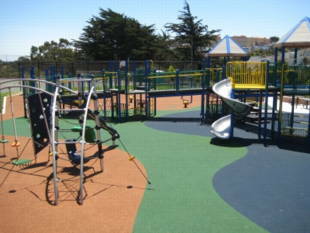 The name St. Mary's Park designates both the small, village-like neighborhood and St. Mary's Park and Recreation Center. When the development's first plot of land was sold in 1924, it set off a building boom and generated construction codes for the architectural styles and plans of the houses. A typical home cost $7,000. 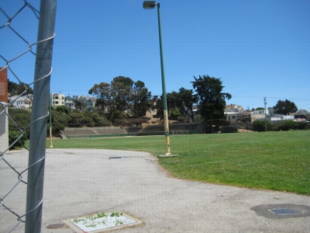 As the community grew, the city of San Francisco set aside 13 acres for a recreation area, 10 of which it bought for $87,500, while the Archdiocese donated the remainder. In the 1930s, Works Progress Administration (WPA) workers repaired the land, and construction of the three-tiered park began in 1947, when voters passed a recreation bond. Mayor Elmer Robinson dedicated the Park in 1951. The Recreation Center sits atop the first tier, housing a gymnasium, auditorium, offices, classrooms and a kitchen. Outside, there's a baseball diamond and an adjacent grassy field for football and soccer games. 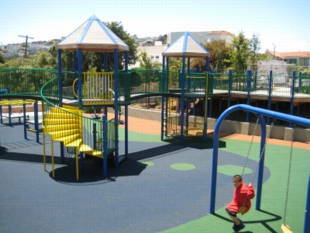 The second tier holds the children's playground area, tennis courts, and a basketball court. And the third and lowest terrace is slated to become a fenced-in dog park, at the neighbors' request. Designed by Rec and Park's Marvin Yee, it will feature a grassy mound, seats and water fountains for owners, and doggie fountains for their pets. Fifty years of use have taken their toll on the grounds and facilities. In replacing the gym's leaking roof, extensive dry rot was discovered on two sides of the building. 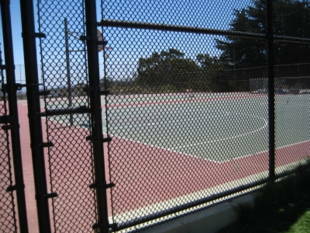 But after new wood was installed, 'there was no money to replace the stucco exterior, so the gym has been closed for nearly a year,' says Jonna Ramey, president of the St. Mary's Park Improvement Club. She says that there is no progress on the dog park nor on architect Shungi Suzuki's redesign of the children's playground, which had the support of Rec and Park officials. Gates at two park entrances, much needed as protection against increasing vandalism, were requested by the Inglewood police captain over a year ago, with no result. While acknowledging that improvements are a long time in coming, she has high praise for the two new park directors and the sports and after-school programs they have implemented for children. 'Perhaps this millennial year will move St. Mary's Park farther up on Rec and Park's waiting-for-improvement list,' she says, somewhat hopefully. Murray St. and Justin Dr.